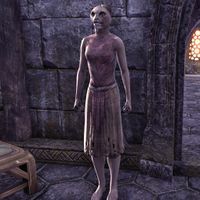 Ashenfur is a Khajiit slave who can be found on the upper floor of the Hissing Guar in Kragenmoor. She appears to be awaiting orders from Dasila Selobar‎, and thus won't talk to you. This page was last modified on 19 February 2017, at 22:58.